from Mascot Precision Tools. 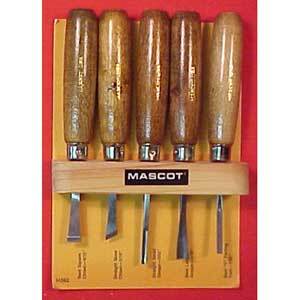 A smaller version of the #66862 chisel set described elsewhere, conventional straight type handles. Excellent quality workmanship. Overall lengths 5-1/2". Includes: 7/32" bent square chisel, 1/4" straight skew chisel, 3/32" straight small gouge, 7/32" bent large gouge and 3/32 bent V parting tool. Handy tools for delicate, intricate work often found in stock making and other carving projects.